The plan seems sound. Cut back on junk food and desserts, scale back the margaritas, join the gym and work out. What happens when this not only doesn’t lead to weight loss but you notice the scale actually going up? “You’re building muscle” people cheer. Yet, your clothes don’t agree. If you have a body composition scale, the muscle is not actually going up. What’s happening, and Why? I think this is one of the most frustrating scenarios and a very, very common one. If you have a trainer or a friend who is your mentor, for whom this formula works like a charm, they might secretly think you’re just not trying hard enough. They’re wrong. The difference is frequently Insulin Resistance. Take 2 people in spin class. One is the instructor, one is a middle aged woman battling overweight and trying her hardest. Their metabolisms are different, their insulin resistance is vastly different. I recently tested a woman in my practice who was a fitness instructor and had gained about 20 pounds. She still looked like a million bucks, but having never struggled with weight, she was panicked. Her fasting insulin level was 2. Yours and mine, up to 19. Overweight, insulin resistant people can have levels anywhere from 150 or even higher. Hers was 2, after a 20 pound weight gain! Once she was given sugar, her insulin level sky rocketed to 12. It’s normal up to 79. Insulin resistant people: 450, even 800 and up. Would it be fair to compare her results with exercise to theirs? No. In an Insulin resistant state — the muscles are no longer responding well to insulin and don’t pull sugar (or, more technically, glucose) out of the bloodstream efficiently — and they begin storing extra fat within and between their muscle cells. Both insulin resistance and fat-marbled muscles are metabolically unhealthy conditions that can be precursors of diabetes. So, if you’re disappointed by your results, consider the possibility of undiagnosed Insulin Resistance. It improves dramatically with a low carb diet, weight loss and some medications. Ask your Dr. to check your levels and address the issue. 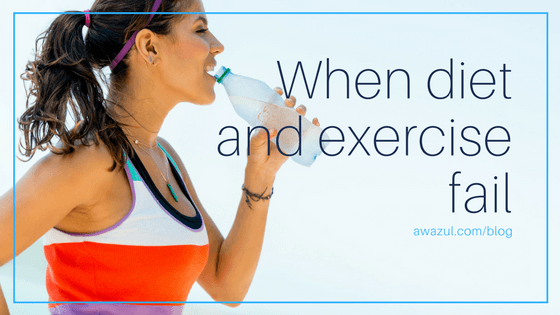 In the meantime, avoid sugary drinks to “fuel” your exercise. Try yoga and strengthening exercises in between all the cardio and next time someone doubts your efforts, respond with “ I do try hard, but my Insulin levels are higher than yours, so my results are not stellar.” I guarantee that will be the last time they doubt you.